The listings have been updated for 2018-19 but CHECK with the ski areas for details about these women's events carefully and see if preregistration is required. For info about gear, check Women's Nordic Ski Equipment. Check the Resort Features Page or the Hot Topics Page for other current upcoming activities. Carter's XC in Bethel, ME has Women's Guided Ski Tours on Tuesday nights 5:00 PM non-vacation weeks $10 for trail pass and a guide ($10 add’l for rentals). Go Red for Women's Heart Disease program at Great Glen Outdoor Center in Gorham, NH on Friday, Feb 1, 2019 with 50% discount on trail passes and rental equipment to those wearing red. Also at Great Glen Outdoor Center in Gorham, NH Women's Winter Escape is on Jan 19-20, 2019 from 8:30 - 4:30 with skills clinics for all levels, snowshoe tours, yoga, lunch, and more all included $89. Lapland Ladies Love to Ski! A special program for women, taught by women at Lapland Lake in Northville, NY. These incredibly popular programs are exclusively for women, taught by women. Join us for one, two or all three sessions! From 9:30am - 2:30pm beginner and intermediate level female skiers, grouped by ability, will receive Introduction on Saturday Jan 12, 2019 and Saturday Feb 9, 2019 instruction in classic technique, and skate skiing on March 9, 2019 - enjoy lunch with an equipment & clothing discussion, participate in a social group ski and group wrap-up with hot beverage at the end of the day. Cost for each five-hour program is $60 including facility use pass, lunch, and discount coupons for clothing and equipment. Cost of rental gear, if needed, is $15 for this program only. Minimum age to participate: 18. To ensure space, please pre-register. Women's Clinic at White Grass in Canaan, West VA om January 26, 2019 10 AM - 12:30 lesson; Lunch and then 1:30 - 3:30 PM for a guided tour. Refresh or pick up some new ski techniques. Instruction available for all types of skiers and experience levels from track and skate techniques to downhill control and telemark turns. Lunch included. The Adventure Center at Waterville Valley, NH is hosting the NENSA Women's Day program on January 20, 2019. Participants would register on-line www.nensa.net/women. There is a gear demo, with lunch, prizes, and wrap up party. For ages 13 and older. Registration has a max of 200 participants. Clinics for every level from first timer to elite racer. The fee is $45 for an individual or $35 for NENSA member. Lutsen Resort, MN on the north shore of Lake Superior in MN has its Girlfriend Getaway Package, which includes a bottle of champagne, massage or treatment, dinner, BF. Timber Ridge Nordic Center in Traverse City, MI has She-Ski a with cross country skiing or snowshoeing and a speaker with munchies on Wednesdays. Ski, Sip & Spa Day at Devils Thumb Ranch Resort in Tabernash, CO on Saturday, Feb 11, 2019 includes XC ski lessons, lunch, yoga, hot tub, sauna, and wine and cheese. Massage or facial available at special rates. This year at the Devils Thumb Ranch Resort there is a Women's Classic Ski Clinic scheduled for 10 AM - 12 PM for all levels including the trail pass and rental equipment on in January - check DTR site for dates. Sun Mountain Lodge and Cascade Endurance in Winthrop, WA has the Women's Winter Adventure Camp on Feb 22-24, 2019 with XC skiing, yoga, breakfast and lunch, ski sessions, wine/hors d'oeuvres reception, and relaxation. Trail Running and Yoga Retreat on April 18-21, 2019. Contact Cascade Endurance. The Vista Verde Ranch in Steamboat, CO has the Share & Save (easier to get your friends together for a Colorado Guest Ranch vacation. If more than 2 people share a cabin, they will give 50% off all-inclusive rates for the additional guests. Get your girlfriends together and save, grab another couple and save, heck maybe even bring your in-laws…..well, we’ll leave that decision up to you. There are three meals a day, cross country ski instruction, guided backcountry ski tours, equipment to use, cooking classes, wine tasting, sleigh rides, horseback riding, photography workshops, and evening entertainment. Such a package includes transportation from the airport to the resort and there are many extras offered to extend the memories such as dogsledding, alpine skiing, massage, and premium wines at an additional price. One of the main concerns for many skiing women is control. Women love the sport - as long as they don't have to go too fast. There is a difference between many women and men in this regard. We seem to have a different definition of survival instinct! Many women have agreed with me that having children has increased that instinct, which is understandable. So how do we deal with it when we are involved in a sport that encourages some risk? The first step is to recognize it, accept it, and know that our approach to overcoming it might be different from men's. Because of this, many women have found their most enjoyable skiing to be with other women - no pressure, no macho, no expectations, and lots of support. Go to an xc ski area and ask if there are "women only" programs available. Check out XCSkiResorts.com for info on women's events and programs. At the same time, challenge yourself to improve your skiing skills. This is guaranteed to subtly build your confidence. Possibly without realizing it, your fears will subside as your skills improve. There are some comfortable ways to improve skills. Number one, work on balance, both on and off the snow. Practice standing yoga postures when you get a chance. When you are on skis, there are many one ski balance exercises you can do. First, on flat tracks with only one ski on and no poles, practice pushing off with the other foot and seeing how far you can glide without putting your foot down. Can you glide to a stop? Next, choose a gentle downhill with tracks. Get a glide going with two skis, then lift one ski and try to keep it in the air while you glide on the other down the hill. You can always put the other down if you start losing your balance. As you get better at this, you can increase the pitch of the hill and the speed you're going. Notice that the faster you go, the more forward the orientation of the body will be to keep up with your skis. Your hips will remain over your feet, but you'll feel yourself flexing the ankles more, and won't have a straight upright stance. This may seem scary, but build it up gradually and it can be quite exhilirating as you become more secure. The third challenge is step turns. Remember, any time you lift a ski off the snow, you are improving your balance! On a gentle slope and wide trail, step to one side for a few steps without turning. Step to the other side. Now try a step turn. Take LOTS of LITTLE steps at first. Remember, you're not striding here; you need to pick up a flat ski and turn it. Don't lift your heel to push off! You'll get your momentum from the hill. Keep your legs bent and your body in a low and stable position. As you get more comfortable, increase the speed at which you do step turns. Try stepping in and out of the tracks at different speeds. All of these exercises can (and should) be done by any level skier. I do them all the time. There are other techniques to improve skills and increase confidence, but let's start with balance. Enjoy those boards that are strapped to your feet; they are meant to glide! Julia West is a member of the PSIA Nordic Development Team and is a ski school director, who lives in North River, NY. Dr. Christaine Northrup, author of "Mother-Daughter Wisdom" and "Women's Bodies, Women's Wisdom," said "My Ski Walking poles have been a terrific addition to my regular exercise program. I love the way they incorporate my upper body during a walk, thus giving me more strength-training and calorie burning for the time spent. I highly recommend them to everyone!" See the full articles about Ski Walking at: the Nordic Walking book on the Product Page and general story on the Personalities Page. 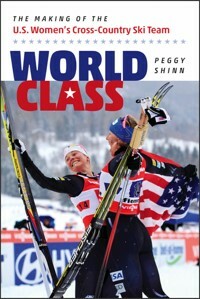 Sports journalist Peggy Shinn answers this question in her enthralling account of the dramatic rise of the U.S. women’s cross country ski team, winners of eight medals at three world championships over the past five years. Shinn’s story—based on dozens of interviews with athletes, coaches, parents, spouses, and friends—paints a vivid picture of the obstacles that America’s female athletes must overcome not just to ski with the world’s best, but to beat them. In a sport where U.S. women have toiled for decades, mostly in the middle or the back of the pack, the development of a world-class team attests to the heady combination of a transformational leader, a coach who connects with his athletes, the super-fast individual skiers who are also conscientious teammates—and a bit of good luck. This is the story of Kikkan Randall, Liz Stephen, Holly Brooks, Jessie Diggins, Ida Sargent, Sadie Bjornsen, Sophie Caldwell, Rosie Brennan, and coach Matt Whitcomb—and how they created the perfect team. This is a timely book, not only because the members of US cross country ski women’s team have been reaching the podium more regularly in the last few years, but because of the prominence of women’s issues and current events in today’s world. Using the simple premise that women products need to be different from men's, some cross country (XC) ski companies went to work designing a line of women's skis and boots that incorporates various differences between the male and female physical characteristics and their interests. For example, women generally have narrower feet, so companies have built boots to accommodate. A woman's whole center of gravity may be shifted compared to a man, which means that application of force from the legs to the skis is shifted, so different flexes in a ski are appropriate. Some product differences are cosmetic but they can also address fundamental interests such as stability or downhill control. Moreover, they are not just for the touring lines—companies recognize the need for women's products in each equipment category, from touring to backcountry to performance and racing. Jan Guenther owner of Gear West, a retail dealer in the Minneapolis area commented that women are often shorter and lighter than men so they might be matched to a ski with a shorter length or softer flex that matches their ability and skiing goals. Alpina Sports designed a line of women's XC ski boots after analyzing 2,500 women's feet using a patented Optical Measurement System and 3D Scanner to arrive at the "ideal" proportions. The fit of the Alpina's women's boots is dramatically different than the typical men's lasted, smaller sized boots that women are often sold. The flex patterns are totally altered, the heel pockets are much narrower, and the cuffs are redesigned for the slightly different calf/ankle configuration of a woman. And now Fischer is making a big splash with its new women's XC line of skis and boots referred to as the My Style collection. The skis have a stable platform and excellent grip and the package includes color-coordinated skis, boots, poles and a ski bag. The skis with names such as Inspire, Mystique, and Desire, Passion include a Fashion product line and the Sport options. These skis are configured lower than their unisex counterpart to account for lighter body weights and designed for the classic technique with less effort required. The ski camber is adjusted to a lower height so it will accommodate the skier who can use less energy to get the ski base waxless grip pattern on to the snow. And there's a new specially developed, very light binding for fitness-oriented women that is very user-friendly with an automatic step in/out mechanism. Fischer has 14 models of women's boots ranging for high performance skate and classic to recreational and off track backcountry. Behind the fashionable designs lie numerous specific developments for enhanced female performance on the trails. Additionally the individual models are tuned to the varied individual skills and sporting ambitions of the respective skier. The Rossignol X1 Ultra FW Nordic ski boot is an easy-to-use entry-level women's touring boot for beginning recreational skiers. The Lock Down foot wrap and Active Control heel provides a women-specific fit along with an external lace cover and simple lace-up design for comfort, warmth, and quick easy-entry and exit. Rossignol's X5 OT FW (Off-Trail) boot combines the best-selling women's touring boot features as well as a Cordura® lace cover and Thinsulate® lining to provide increased off-trail versatility, durability, and warmth. In-track or off-trail the free-hinge cuff with velcro powerstrap provides fuller mobility, stability, and control. These Rossignol boots feature new external cuff gaiters ultra-durable Cordura® lace covers, Thinsulate® lining, and a Thermo-moldable fit, for women who want comfort, durability, and warmth while exploring off-trail. Salomon Nordic has women-specific boot models in classic, skate, and combi (can be used for either skate or classic skiing). These boots include lightweight carbon chassis, heel adjustments and dialed-in flex for women. Mariah Frye-Colie of Cross Country Ski Headquarters, a Michigan cross country ski retail and area operation commented, "Women like to feel good with product options that flatter a women's body, but also are functional and comfortable. The Nordic ski manufacturers have woken up to the demand and it's great to have more feminine equipment and clothing."